The HP Deskjet 6830v colour inkjet printer is designed for SOHO users. This model promises professional-quality images and laser-quality text. Unlike other printers, the HP Deskjet 6830v inkjet printer can operate even if one ink cartridge has run out. It has ink-backup mode. This model also has standard networking connectivity and offers a PictBridge port. Cloud and mobile printing isn’t supported. 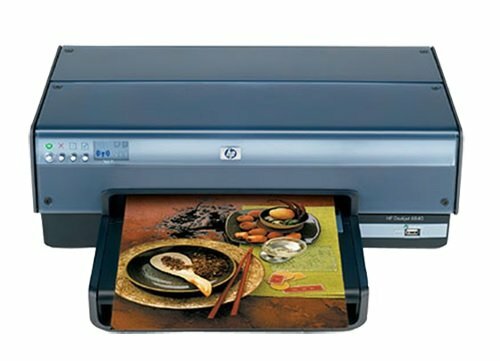 The compact HP Deskjet 6830v colour printer measures 5.7 x 17.7 x 14.5 inches and weighs 210.88 oz. This model has a single paper tray that can carry up to 150 plain sheets. The Deskjet 6830v can print on different types of media including banner paper, labels, photo paper, transparencies, envelopes and index cards. For connectivity, this model has Ethernet, USB and PictBridge ports. Photo printing is easy with the HP 6830v inkjet colour printer. It offers a maximum resolution of 4800 x 1200dpi and the Deskjet 6830v photo printer supports borderless photo printing. Users can even use the PictBridge port to print photos directly from digital cameras. The Deskjet 6830v printer has a speed of 25ppm for monochrome and 20ppm for colour. Its duty cycle is 5,000 pages per month. The HP 6830v Deskjet printer may have standard Ethernet connectivity but it would be better if it had built-in Wi-Fi, too. More users would be able to access the HP 6830v colour inkjet printer if it offered mobile printing.